Absolutely loved Nico’s recovery room. It’s a tiny little bar, and you have to find a parking spot on the street, and when we pulled up we honestly didn’t have high expectations. When you go in, you seat yourself, and not a minute after we sat down, a waitress was over to help us. We had the mozzarella sticks, which were clearly homemade, and AMAZING. I’m not a big drinker, but I wanted to have one of their cocktails. I ended up getting a White Russian (which was huge! Literally the size of a normal soft drink!) and it was delicious! Price I found to be reasonable at I believe $7. Their menu is better than standard bar food. It’s a mostly Greek inspired menu, but they also have a great selection of sandwiches. I had the club sandwich, on a pretzel bun! It was delicious. We also ordered a side of fries, which were wonderful as well. Think of potato patch fries, but crispier! The service was great. 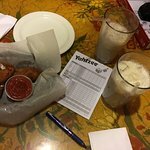 Our waitress was fun and friendly. We will definitely be returning to this little gem! Literally right around the corner from me, my girlfriend and I get take-out from here 1-2 times a month. Usually on a night we don't feel like cooking. They have a great "munchie" basket that's quite large and great fries. They also have nightly specials. The Greek fare is nice but about average. A Greek restaurant would do you better. They have the usual burgers, Reubens etc., that are good but a little on the smaller side as well as other typical tavern food. The place itself is more of a local hangout and although it's pretty worn it's relatively clean. Not a bad spot for a few brews and a bite. The staff are friendly and there's always a game of some sort on one of the TVs. Also game night beer specials during Steelers, Pens & Bucs games. Nothing superb but not a dump either. However, on Sat nights it can get a little loud due to the karaoke. At the corner of Friendship & Pearl it's a block from the main drag of Liberty Ave in the Bloomfield section of the 'Burgh. I love this places greek platter.. it has a variety of greek food ( crispy feta filed phylo, feta cheese, tomatoes, olives, pita bread, and rice filled leaves.. Mmmmm and it is very filling, ..around 10 bux. I always get it to go.. a must try! Definitely a grotty bar room atmosphere but service exceeded and food met expectation of casual Greek cuisine. Recently went to Nico's for first time. 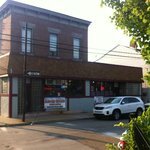 Nothing amazing, but good local bar in Bloomfield with cheap prices and good service. Also a good place to watch a game, went for March Madness games and employee let my friends and I have the remote to switch around to different games. 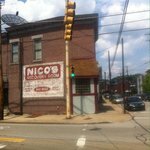 Been to Nico's Recovery Room? Share your experiences!